This is the eleventh part of a fiction serial, in 1275 words. Vanessa came back with the coffee. She sat crossed-legged on the bed, passing over the mug. It was fragrant, and sweet. Martin wondered why it was sweet, as he had never taken sugar. From a bedside table, she took a pack of cigarettes, and a lighter. Lighting the long, white tube, she passed over the packet and lighter to Martin, reaching behind to retrieve a huge crystal ashtray. He slid a slim cigarette from the pack, sparked the classic Zippo, and lit it. It wasn’t until he inhaled that first dizzy lungful, and blew it back out over Vanessa’s chest, that it dawned on him that he didn’t smoke. Well he did now, that was obvious. Patting her leg with his free hand, he tried to look as serious as he could, without unduly alarming her. “Not fooling, honey. Deadly serious. I can’t remember a bloody thing. I need you to fill me in on all the details, everything that happened since we first got together. The lot. How we got here, where we are, how long we have been here. Just pretend I know nothing at all, and you won’t be far wrong”. Vanessa suddenly stretched out her right leg, rubbing the calf furiously, to ease the sharp pain of a sudden cramp. He watched as her breasts bounced around because of her actions, occasionally slapping into each other. When she had calmed down, she smiled. “I sat too long with my legs crossed, should have known better. Now, stop mucking about, Martin. What do you fancy doing today?” She turned to the side, placing her empty coffee cup on the cabinet. He spoke quietly, his tone finally convincing. “I mean it, it’s serious. I really don’t know, I swear to you”. Her irritation changed to alarm, as she took in what he was saying. “Oh God, maybe you’ve had a stroke or something. Christ, Martin, you should have said. Shall I call an ambulance? Get a doctor out?” Shaking his head, he smiled reassuringly. “No need, it’s probably just some sort of blip. Just tell me what I need to know, and I’m sure it will all come flooding back. Don’t leave anything out, even the small details. Really, don’t worry, I just need to get the pieces together in my head”. She didn’t look very sure about that, but started to talk. “Well I had seen you in the bank, on and off. You always gave me a look, you know, one of those looks. I thought you were really nice, but to be honest you often looked a bit shabby”. She paused. “Is this what you want? Is this how you want me to tell it?” He nodded. “Go on. Yes. Just like that”. “Well one day, you came in wearing a lovely suit, and looked so smart and handsome. The manager shook your hand, and took you into her office. Later on, you came out, and beckoned me over. You said that you would like me to join you for dinner that night, at The Ritz Hotel. I thought you were teasing me, and laughed it off. But you gave me the number of the hotel, and your room number too, telling me to call you, if I changed my mind. After you left the bank, one of the girls told me that you had won the Euromillions Jackpot. So I waited until I was due to leave work, and phoned you in The Ritz, to make sure. You answered, and I agreed to have dinner with you at eight”. Martin raised a hand to stop her. “So it was the money then? That’s what made the difference, and changed your mind about the date?” Vanessa looked upset. “You really don’t remember, do you?” He shook his head, and she carried on. “I was married, Martin. I couldn’t just drop everything, and go out for dinner with a man I thought was winding me up about living at The Ritz. I would have to come up with a bloody good excuse to get out that night, or face all the grief from my husband. But when I found out you had a hundred million or whatever, yes that changed my mind. I just thought what the hell, I’m doing this. So I put on my best cocktail dress, told my husband I had to go to something at the bank with short notice, ignored his moans about it, and came to meet you at The Ritz. We had dinner, and lots of wine, went up to your room, and the obvious happened. Before I left to go home, you asked me to just walk away from it all, leave my husband, and go to live with you in Spain. And amazingly, that’s just what I did”. She stopped talking, and lit another cigarette. Martin looked through the glass doors at the bright sun outside. “So we’re in Spain then?” Vanessa seemed exasperated now. “Yes. Spain. El Palo, a few miles from Malaga. Are you sure you are not playing a joke on me, Martin? I won’t be happy, if you are”. He finished the last of his coffee, and gave her his best grim face. “I promise you, I have no recollection of this at all. How long have we been here?” She still didn’t sound convinced. “Just over a year. Look, remember this?” She waved her left hand in his face, showing a huge diamond engagement ring on the third finger. “We are engaged, just waiting for my divorce to be sorted out. You told me that as soon as I got the papers, we would get married, and I would be Mrs Harwood. I hope you haven’t conveniently forgotten that too? Bloody hell, Martin, I even agreed to a pre-nup with your lawyer”. His face softened and he smiled warmly. “That sounds good to me, Vanessa. If that’s what I said, then that’s what will happen. I promise”. She relaxed, her body sinking back onto the bed. He waited a while, and then asked another question, trying to sound casual and offhand. Excellent episode, Pete. Cliffhanger ending, of course. Headed over to Part 12! Definitely! Best to you, Pete. I am glad you are keeping this all straight. It is stretching my brain this snowy afternoon. Great so far. I love the last line. If the typewriter has gone missing what would happen if someone else used it? As you know, I like to tell stories through dialogue, and you did an excellent job of that with this latest installment. Kudos! Gee, I just thought I was lazy! 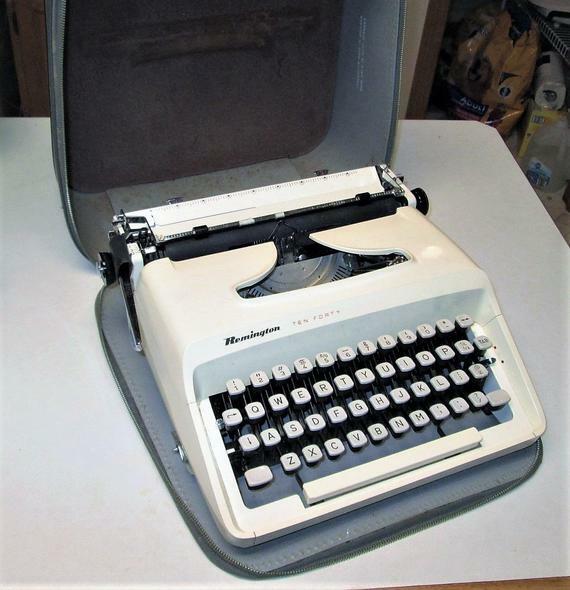 This story is like a horrible dream!… And the typewriter! What if Vanessa is going to say: “Oh, I gave it to some beggar nearly one year ago.”… Thrilling, more and more thrilling! Uh-oh, we’ve got to find that typewriter! His security blanket, I can understand that. Well, it has been thus far….